Points Needed: 15350 Games are not compatible with mobile and tablet devices. Please add this title to your Wish List and sign on to your the first club account from a desktop computer to complete your redemption. NOTICE: Activation key must be used on a valid Steam account, requires internet connection. DOUBLE PACK	Save the world from an Alien invasion as President of the United States or face the threats of post-apocalyptic Moscow. 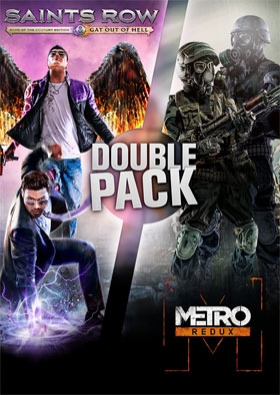 This Double Pack contains: Saints Row IV Re-Elected (including the standalone expansion Saints Row Gat Out Of Hell) Metro Redux (including Metro 2033 Redux and Metro Last L… ight Redux) METRO REDUX	Including the epic single-player campaigns of both Metro 2033 and Metro: Last Light, Metro Redux takes you on a journey from the forgotten catacombs beneath the subway to the desolate wastelands above, where your actions will determine the fate of mankind. SAINTS ROW IV RE-ELECTED AND SAINTS ROW GAT OUT OF HELLThe US President must save the Earth from alien overlord Zinyak using an arsenal of superpowers and strange weapons in the wildest open world game ever. The Saints have gone from the crackhouse to the White House—but the Earth has been invaded and it’s up to you to free the world from Overlord Zinyak and his alien empire. With homies new and old by your side, and an arsenal of superpowers and strange weapons, you must save the world in the wildest open world game ever! And just as this problem is solved, the President gets kidnapped by the devil. Johnny Gat makes his way down to Hell to free his bro.SYSTEM REQUIREMENTS Windows	Minimum: OS: Windows Vista (x86 or x64) Processor: Intel Core 2 Quad Q6600 / AMD Athlon II x3 Memory: 4 GB de mémoire Graphics: NVIDIA GTX 260 / AMD Radeon HD 5800 series DirectX : Version 10 Recommended: OS: Windows 7,8,10 (x86 or x64) Processor: Intel i3 2100T / AMD Phenom II x4 or higher Memory: 4 GB de mémoire Graphics: NVIDIA GTX 560 / AMD Radeon HD 6800 series or higher DirectX : Version 11 Linux Minimum: OS: Ubuntu 14.04.3 LTS or SteamOS Brewmaster Processor: Intel Core i3-2100 (3.1 GHz) or AMD Athlon II X4 645 AM3 (3.1 GHz) Memory: 4096 MB RAM Graphics: GeForce GT 440 (1024 MB) or Radeon HD 6670 (1024 MB) Additional Notes: Recommended Graphics Drivers: Nvidia: 352, 355 or 358 series driver / AMD: AMD Catalyst (fglrx) 15.9 or better. MESA drivers and Intel Graphics are not currently supported. Recommended: OS: Ubuntu 14.04.3 LTS or SteamOS Brewmaster Processor: Intel Core i5-2500K (3.3 GHz) or AMD FX-4300 (3.8 GHz) Memory: 8192 MB RAM Graphics: GeForce GTX 660 (2048 MB) or Radeon HD 6970 (2048 MB) Additional Notes: Recommended Graphics Drivers: Nvidia: 352, 355 or 358 series driver / AMD: AMD Catalyst (fglrx) 15.9 or better. MESA drivers and Intel Graphics are not currently supported. Mac System Requirements only for Metro Bundle	Minimum: OS: OS X 10.9.5 Mavericks or newer Processor: 3.2 GHz Intel Core i5 Memory: 8 GB de mémoire Graphics: Radeon HD7950 3GB / NVIDIA GeForce GTX 750m 1GB Additional Notes: Notice for OS X Yosemite 10.10.5 users with an Nvidia graphics card at or above the minimum specification listed: Currently separate drivers are available to fix performance issues specifically affecting Nvidia users who are using OS X Yosemite. These drivers are currently only compatible with OS X Yosemite 10.10.5 and can be found here http://www.nvidia.com/download/driverResults.aspx/89538/en-us. Recommended: OS: OS X 10.9.5 Mavericks or newer Processor: 3.2 GHz Intel Core i5 Memory: 8 GB de mémoire Graphics: Radeon HD7950 3GB / NVIDIA GeForce GTX 775m 2GB Additional Notes: Notice for OS X Yosemite 10.10.5 users with an Nvidia graphics card at or above the minimum specification listed: Currently separate drivers are available to fix performance issues specifically affecting Nvidia users who are using OS X Yosemite. These drivers are currently only compatible with OS X Yosemite 10.10.5 and can be found here http://www.nvidia.com/download/driverResults.aspx/89538/en-us.